OSC DP2 ES&S class touring and learning about the stages in PET recycling at Viridis. Weighing PET plastic from the OSC collection. According to the World Bank, 2.01 billion tonnes of municipal solid waste (MSW or SDW) are produced annually around the world (World Bank). The increase of solid waste, including the production of non-biodegradable plastic, is one of the most significant human induced problem that the world faces today. Today large amounts of discarded plastic end up in the environment-both terrestrial and marine ecosystems. Ocean plastic is responsible for serious pollution and negative impacts to marine ecosystems is well documented. A negative aspect of plastic on the environment that Sri Lanka faces is the uncontrolled burning of plastics and other solid domestic waste (SDW). There are serious health impacts of this widespread practice that are not fully understood yet. “Some plastics we know are toxic, such as poly-vinyl-chloride (PVC). PVC contains phthalates and heavy metals and creates dioxins when it burns” (Ecology Center). In Sri Lanka, solid waste has become a serious, but uncomfortable problem for urban planners to deal with. This was brought into the public sphere when the Meethotamulla garbage dump collapsed and destroyed many homes on April 14th 2017 (Roar). Two years on and the country is still struggling with how best to manage solid waste in the face of growing production of SDW. Global production and consumption of plastic continuously rises in an age of sometimes contradictory development, prosperity, disparity and globalization. The challenge with plastic waste in now well documented (see links below) and understood but the momentum of the problem and its links to consumption habits which drive economies is hard to address. The idea of recycling plastic (and other) waste has economic merits while also addressing part of the problem that countries like Sri Lanka face. 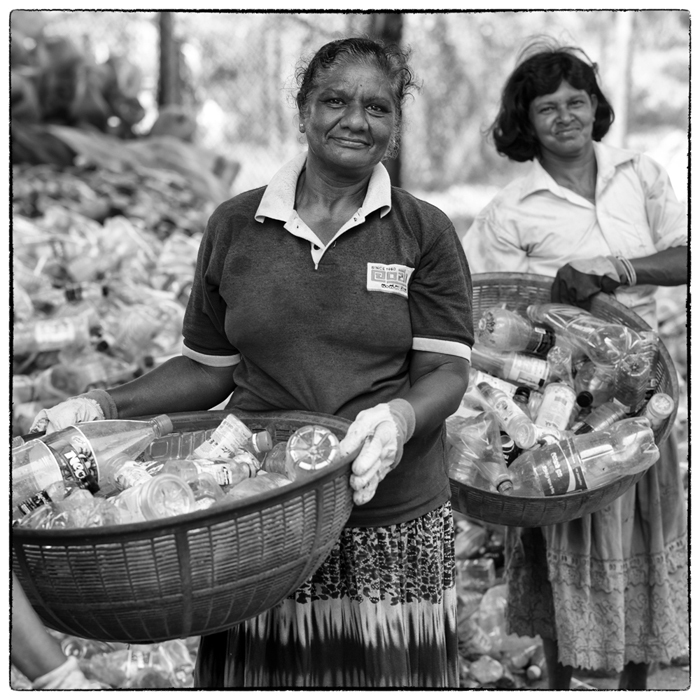 Several businesses are working as recyclers in Sri Lanka. They help to manage the rather enormous amounts of single use and other plastic produced by this small island while also struggling to run a profitable business at a time when petroleum and virgin prices are relatively low. Viridis weigh counter with 9.8 kg of OSC PET waste. On March 1, our DP2 Environmental Systems and Societies class visited the Viridis Recycling Plant. 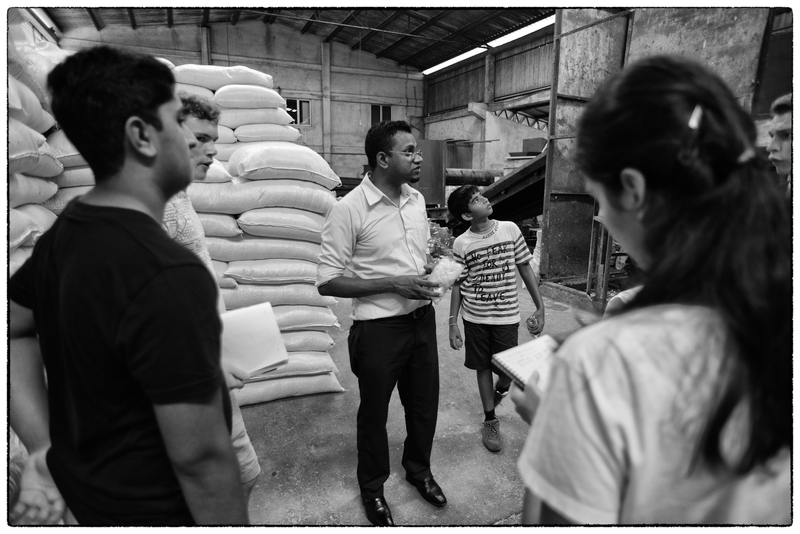 We spoke with Sathyajith Wijerathne, who gave us a tour of the facility. This company focuses on the recycling of plastic materials in Sri Lanka. At the moment, it is the leading plastic recycler and polyethylene terephthalate (PET) flake exporter in Sri Lanka. 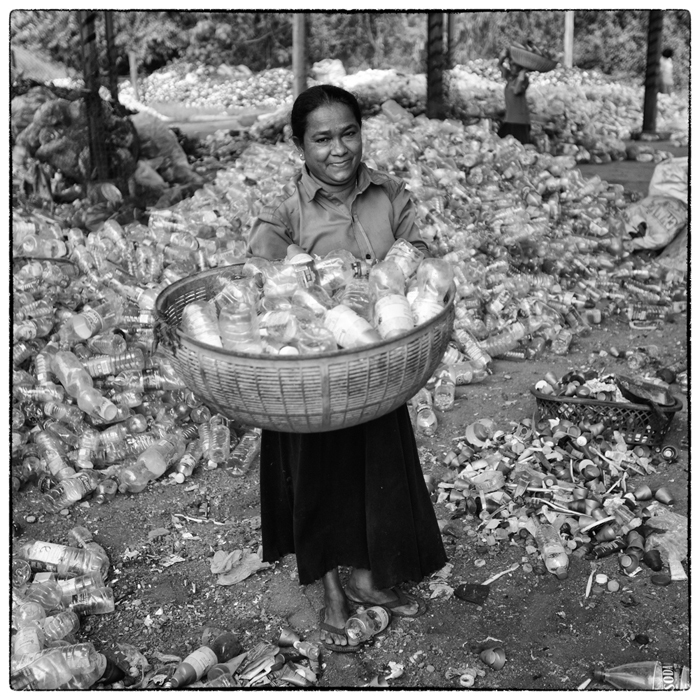 Waste plastic bottles and other items are collected and brought to the factory in the Templeburg Industrial Zone, Panagoda, Homagama. The company employs 30 manual workers and an additional 4 drivers. Once inside the facility the plastic is segregated and then cut into small pieces called PET flakes. “These PET flakes are [later] used as the raw material for a range of products that would otherwise be made of be made of polyester” (Viridis). Most of the plastic that they recycle is exported while a smaller percentage is used in local manufacturing in Sri Lanka. Heavy duty plasics () being prepard to be chipped into smaller pieves. Finished sacks of chipped, cleaned, and separated PET ready for export. During our visit, we had the opportunity to see what procedures were taken with the plastic they collect. 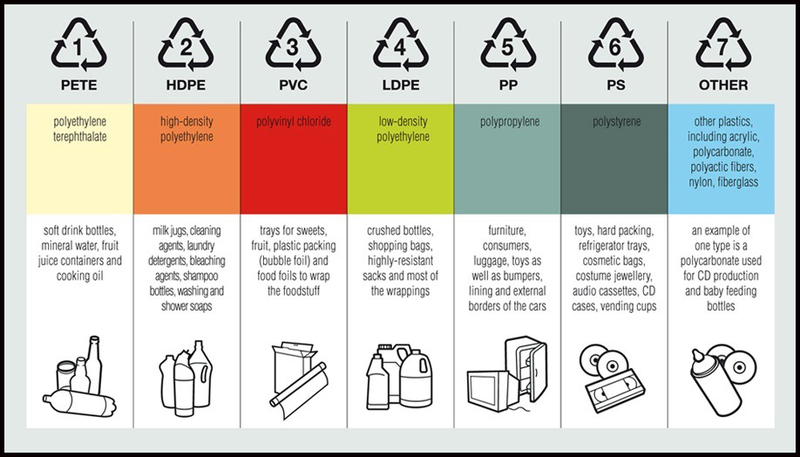 The different types of plastic first have to be separated into colors and types. They are then cut into very small pieces in a machine and are later washed and dried. They are first soaked in barrels, cleaned and then water is extracted. In order to completely dry the tiny pieces of plastic, they are set on trays and are baked in a large electric oven. Finally, the many pieces of plastic are set in bags to be sent to other companies that will create products out of the recycled plastic. Most of this is exported outside of Sri Lanka. Recycled Viridis plastic ready for sale. The Color of the plastics has an important influences on how much recyclers can get for their products. Clear plastic earns more. Through this experience, we learned more about the different types of plastics, such as HDPE (for example, chairs) and HIPS (for example, computers). It is therefore important to separate plastics since they are used for different purposes. It is important to have companies, like Viridis, that recycle plastic in order to move towards a more sustainable planet. However, recycling requires a lot of energy and thus reducing and reusing are still preferable strategies for dealing with how we consume plastics. Albeck-Ripka, Livia. “Your Recycling Gets Recycled, Right? Maybe, or Maybe Not.” New York Times. 29 May 2018. Web. de Freytas-Tamura Kimiko “Plastics Pile Up as China Refuses to Take the West’s Recycling. “ New York Times. January 2018. Web. Kaza, Silpa et al. What a Waste 2.0: A Global Snapshot of Solid Waste Management to 2050. Washington, DC: World Bank. 2017. Web. Milman, Oliver. “‘Moment of reckoning’: US cities burn recyclables after China bans imports.” The Guardian. 21 February 2019. Web. Parker, Lisa. “Planet-or Plastic?” National Geographic. June 2018. Web. Semuels, Alana. “Is This the End of Recycling?” The Atlantic. 5 March 2019. Web. Sorting plastic by kind and color. Cutting larger, heavier plastic with a machete. Plastic is a non-biodegradable material that is being accumulated in the world today in disturbing and alarming quantities (see the Guardian’s 2017 article for an update). Although plastic is an important resource in our daily lives, its end product contributes seriously to the broader problem of mismanaged Solid Domestic Waste (SDW). Since plastic it not biodegradable, the way in which it is disposed is important, as if it is incorrectly disposed, it can cause environmental pollution, along with other health related issues. Other than reducing the consumption of plastic (the best solution) one of the alternatives to the incorrect disposal of plastic, is recycling the plastic. However, this method does not reduce the amount of plastic that there is in the world, and the recycling process usually involves a lot energy. Nevertheless, there are other comparatively efficient ways to deal with the management of plastic waste, but this article focuses mainly on recycling as a potential solution. The issue regarding the management of plastic is of global significance – it is challenging to effectively and efficiently dispose of plastic, mainly because most plastics are non-biodegradable – they will remain on earth in the same form for a long time – and because humans have become excessively dependent on plastic. Moreover, this hinders the chance of people reducing the amount of plastic that they use, inevitably forcing re-using and recycling to appear as more feasible methods for the management of plastic. Mr. Nilantha Gamage, from the management team, gave us a tour of the Viridis facility. He started by providing us with statistics related to what they were doing at the center. He told us Viridis trucks and teams collect and process approximately 100 tons of plastic waste a month. It is estimated that Sri Lanka imported about 15,000 tons of PET (Polyethylene terephthalate) during a similar period of time (see Chrishanthi Christopher’s Sunday Times article). Thus, depending on statistics for the country, Viridis is only processing a small percentage of all of the plastic being produced and consumed in Sri Lanka. Mr. Gamage also addressed some of the economic issues that they face while recycling the plastic. For example, he spoke to us about how people prefer to use virgin plastic (plastic that is produced new from the petroleum refining process), therefore the selling prices of non-virgin plastic (plastic that has been recycled) in the market would remain higher than that of virgin plastics – because virgin plastics are in demand and more people are buying it – hence it is slightly difficult for them to sell the plastic that they recycle. Mr. Gamage then directed us outside where we observed how they handle the plastic in the Viridis recycling plant. Step 1:They started off by separating the plastic according to its color, after which they would put the plastic bottles into a machine which would remove the sticker around it, as well as the bottle caps. Step 2: Following this was the shredding process, which was also done by a large, noisy machine. However, if the plastic was too big to be shredded – like a plastic garbage bin – then a Viridis worker manually chop the plastic into smaller chunks before shredding it (The shredded plastic looks like colored plastic rice grains). Step 3: Even though the plastic was shredded, it was still dirty. Therefore it was put into a tub of water, washed and finally dried in an electric oven. 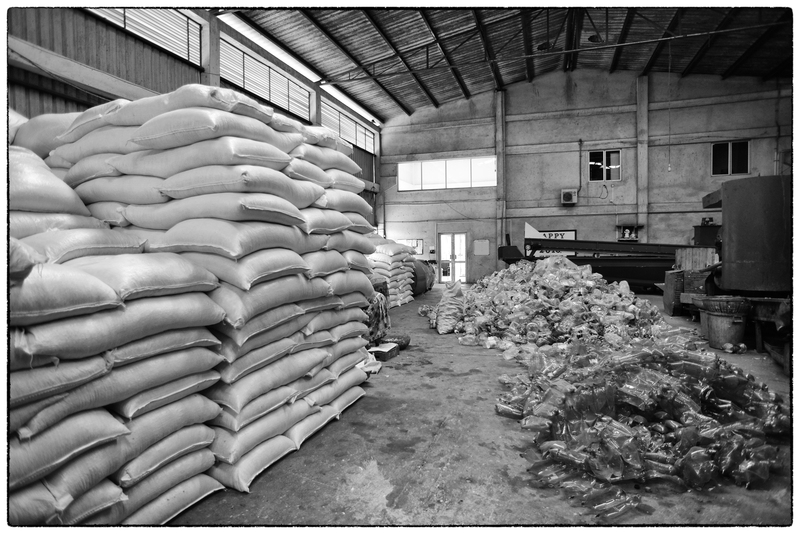 Step 4: The end of the drying process was followed by the beginning of the packing process, and it is then ready to be exported to buyers. Unfortunately, it is at this point, that they face the economic challenge – the price for recycled plastics is very as a consequence of relatively low crude oil prices. at which they are selling the plastic is low and they are barely breaking even. While we were exploring the Viridis recycling plant, I observed that the plant consistently incorporates the use of a lot of energy in their machinery (the shredder, the machine that removes the bottle caps and the stickers as well as the oven), thus I wondered how much energy they consume in a month. I approached Mr. Gamage and asked him, and he told me that they consume roughly 8,000 units of energy in a month: which is a lot of energy; supporting the fact that even though recycling is considered an effective way to handle plastic waste, it still consumes a lot of energy in the process, which makes it a slightly inefficient process! Many high-income countries (Europe and North American notably) used to export their plastic waste for recycling in China. However, in 2017 China banned other the import of plastic waste because they did not want to be the “world’s garbage dump” (Freytas-Tamura). This affects many high-income counties as the volume of plastic in their recycling centers is high and China has always been a good market. Hence, they are struggling to effectively manage the plastic. Consequently, this reflects how much people in the European region depend on plastic and also, countries do not want to be responsible for handling plastic waste. The John Keels group has also recently taken the initiative to address the management of plastic and recycling plastic. Moreover, their website is very insightful, as it shows its users the exactly where they can drop off their plastic waste, and it simultaneously spreads awareness if it reaches the right audience. It is possible to get more information regarding this by visiting their website. Our trip to the Viridis plastic recycling center was insightful, not only because we had the opportunity to see how plastic is recycled, but also because it shaped our understanding of the rising global concern of effectively managing plastic and the problems associated with it. Christopher, Chrishanthi. “Reusable bags diktat doubles plastic imports” Sunday Times. 12 February 2017. Web. Fazlulhaq, Nadia. “War against plastic waste hampered by don’t-care public.” Sunday Times. 29 June 2014. Web. Freytas-Tamura, Kimko. “Plastics Pile up as China Refuses to Take the West’s Recycling.” New York Times. January 2018. Web. Laville, Sandra and Matthew Taylor. “Bottling it: A million bottles a minute: world’s plastic binge ‘as dangerous as climate change’”. The Guardian. 28 June 2017. Web. Quora. “What are some types of plastic?” Web. As our world is developing, solid domestic waste is becoming a significant problem. Solid domestic waste (SDW) is which is garbage from industries. The production of solid domestic waste contributes a lot to air and land pollution. One common type of solid waste is paper. According to The World Counts 50% of business related waste is composed of paper. In the United States alone, 12.1 trillion sheets of paper are used every year, just for office purposes (World Counts) . That is A LOT of trees. 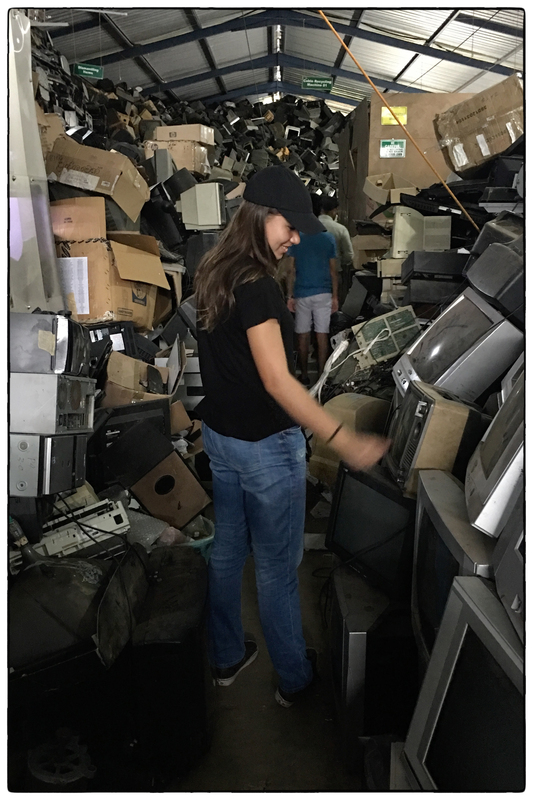 As part of our unit on resources and solid waste management, the DP Geography class visited several Colombo-based recyclers and scrap dealers. Upon arriving at the local Pelawatte scrap dealer DP 1’s geography class of 2019 (which includes Devin, Dominic, Jordan, Maha, and Sarah), led by Mr. Ian Lockwood , got an insight on what the Recycling and Sustainability service group embark on every Thursday during their service hours. Analogous to the Recycling and Sustainability service group’s ultimate goal of reducing the ecological footprint of the OSC community, the aim of this article is to raise awareness for paper management in the OSC community and to ultimately inspire those affiliated with the school to follow in the footsteps of the former generations of recyclers at OSC and take action against the rising solid waste management crisis that is still ongoing in Sri Lanka. My first impression of the scrap dealer was that he processed more assets than he actually had the space! There were piles and piles of old refrigerators and vehicle parts lying around the outside of his shop. However, to my amazement, he still had enough room in his office (a recycled shipping container) to take in waste materials such as paper, cardboard, aluminum, and copper all at varying prices (prices in the table below) . Although the amount of money received on our part and the size of the contribution by our group to the scrap dealer was minimal, any initiative whether large or small helps to redue the ecological footprint the OSC community . What the field visit to the scrap dealer (and subsequently the Viridis and Ceylon Waste Management company) showed us is that individuals in Sri Lanka are taking actions to help control the damage of solid waste. Through the recycling initiatives the Overseas School of Colombo is on its ways to being more of a solution that a cause of the problem. John Keells. Plastic Cycle. Web. Solid waste is a global problem that is becoming difficult to manage. Most of us throw our garbage into a rubbish bin, but do we know where this garbage goes? 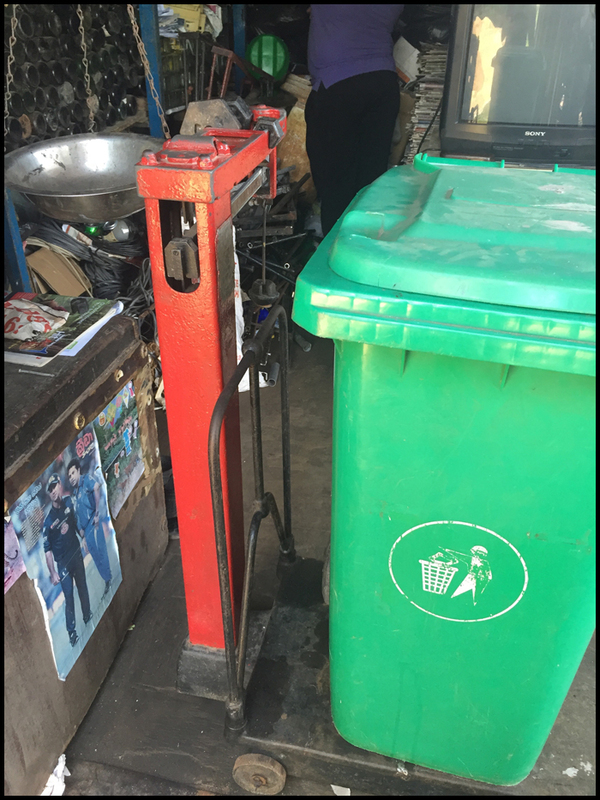 On the 3rd of March, the DP 1 Geography class visited two recycling and scrap centers in the Pelawatte Area (near the OSC campus). They were relatively small places, but they gave the class an idea of what happens to the items that we throw away. Solid waste management is a problem that Sri Lanka is facing, and there is only a small group of people who are working to recycle some of the items we throw away. In Colombo itself, 700 tons of garbage is collected each day (Roar), which is 58.6% of the total garbage collected in Sri Lanka (Sunday Times). To the majority of us, this value may not concern us, but where does this garbage go? In Colombo, the garbage collected has historically been dumped at the Meethotamulla landfill, which is located 30 minutes from OSC, and has now become unusable, because of the various environmental hazards caused by the large amount of garbage dumped there. The problem in Sri Lanka is that the majority of garbage collected is not separated. Therefore it cannot be effectively recycled or disposed of. Based on a study conducted in 2012 by the Central Environmental Authority, 54.5% of the waste that is collected is biodegradable, which means that they can be composted (CSECM). If people were to compost this biodegradable waste, half of the garbage at the landfills would have never even be there. Separation is the key. The people at the recycling and scrap centers we visited are examples of environmental heroes, who are not given the credit they deserve for the work they do. The picture below is the first recycling center we visited. It was a small place,but there is a lot of cardboard stacked out in front. All of that will be recycled. If this center was not there. That cardboard would have ended up at a landfill (or been burnt). Inside the the recycling center there were plastics, glass (bottles), and scrap metals which were all being collected to be recycled. Weighing the paper collected from school at the first recycling center (2 minutes from OSC). This is where the Recycling & Sustainability (Train to Sustain) service group takes its paper every Thursday. 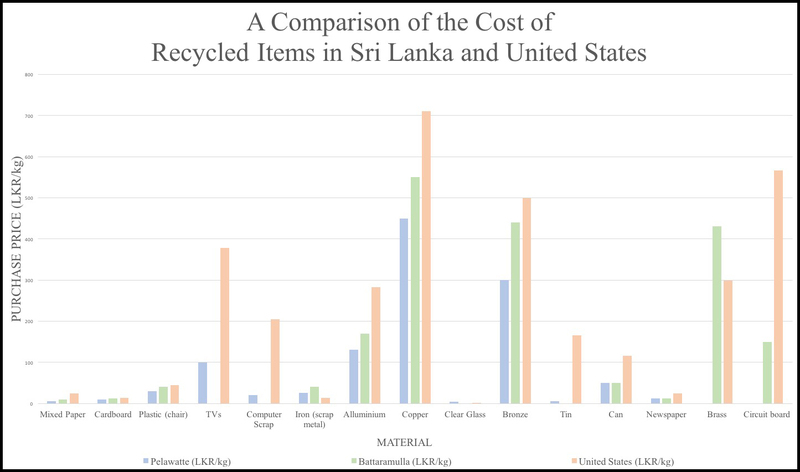 Graph showing comparative buying costs for commonly recycled items in Pelawatte (where OSC sells its items), Battaramulla and the United States. Compiled and graphed by Thiany, Yuki & Malaika. 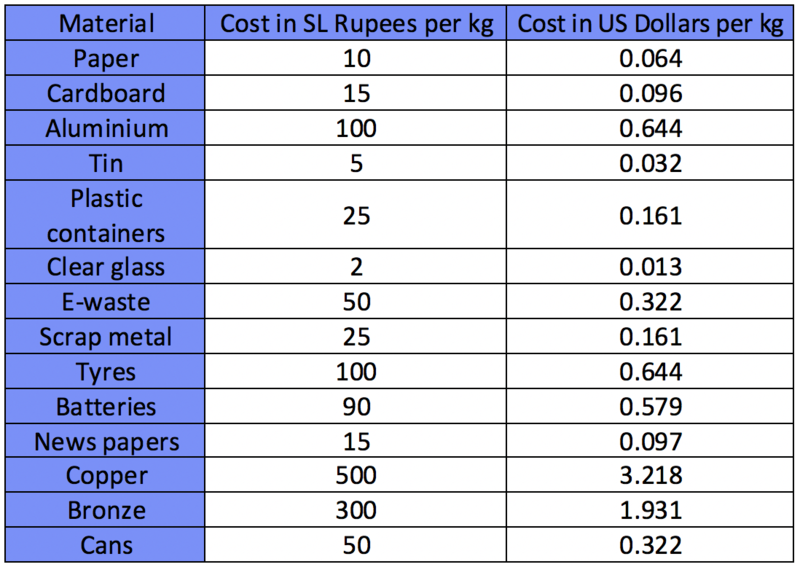 A graph comparing prices of low-cost recycled goods (buying price) in Pelawatte (where we sell our material, Battaramulla and the US. The people who own centers like this, are not recycling materials because they want to save the environment, instead they are doing it for an economic reason. They are able to make money off recycling materials, and by doing this, both themselves and them and the environment are benefiting from it. Solid waste disposal is becoming a huge problem that needs proper management. A step each of us can take is separating our biodegradable waste from the rest, and compost it. This would reduce almost half of the garbage that is collected from us, and in turn reduce half of the garbage that is dumped in a landfill. The next step is recycling items such as paper, and plastic. By taking these steps, solid waste would not be such a large problem. Article by Anaath & Adrian with contributions of the Class of 2018 DP Geography class. Data analysis and presentation by Thiany, Tuki & Malaika. Survey 123 data and analysis by Fatma, Easmond and Zoe. Photographs by Adrian and Mr. Lockwood. Doole, Cassandra. “Garbage Separation And Recycling Are Finally Here (For Colombo, At Least).” Roar. 5 July 2016. Web. “Garbage Collection and Recycling in the Dumps.” The Sunday Times Sri Lanka.”17 Jan. 2016. Web. Sapra, Satyanshu. “The Business of Reincarnation – Bringing Discarded Metal Back to Life!” Recycling & Sustainability Blog. 2014. Web. 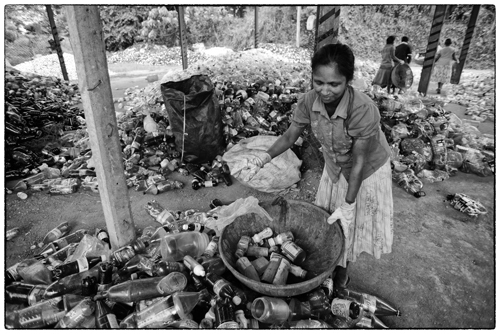 Sustainable Approaches to the Municipal Solid Waste Management in Sri Lanka.” Municipal Solid Waste Management in Developing Countries (2016): 119-32. SECM. 13 Dec. 2015. Web. Widanapathirana, Akash. “Biggest garbage generator tries to put house in order.” Sunday Times. 19 March 2017. Web. Plastic waste brought from the beach town/ tourist hub at Hikkaduwa for recycling at Viridis. Plastic remains one of the single biggest and intractable solid waste management challenges in Sri Lanka. One doesn’t have to look too far to see plastic waste dumped along roadside or smoldering in small neighborhood fires. Currently, the Sri Lankan government as a part of their effort to improve recycling and resource management has been slowly trying to ban more of the less degradable plastic (CEA). The issue was covered by the Sunday Times and other news organizations (see links below). However, annual plastic consumption is increasing in Sri Lanka and is set to increase from 6kg to 8kg per capita (Sunday Times). Waste management strategies not able to fully deal with the existing amount of plastic solid waste so what happens when the amount increases? This short post will look at the basic economics and geography of what is being done by a plastic recycling factory in the OSC neighborhood. One of the largest plastic recycling companies in Sri Lanka is Viridis Pvt. Ltd. They have a fleet of 6-9 trucks that gather plastic from the most densely populated parts of Sri Lanka (from Anuradhapura in the north to Katharagama in the south). They currently buy plastic at around 20 LKR/kg but it fluctuates depending on petroleum prices (two years ago it was 40/kg). At the moment, petroleum prices are low and virgin plastic is cheap. Thus, the price for recycled plastic is relatively low. The global price for a unit of plastic has fluctuated as from 86 to 274 LKR (0.6 – 1.9 US$). Viridis collects most types of recyclable plastic such as PET bottles and higher grade plastics (buckets, toilet seats etc.). They used to collect plastic bags, but it is no longer cost effective. OSC’s DP Geography class visited the Viridis recycling plant as part of their Patterns in Resource Consumption unit. They were joined by several members of the Recycling & Sustainability group. In fact, student leaders Nandini Hannak and Nisala Shaheed along with their faculty facilitator Ian Lockwood had made a preliminary visit in December (see their blog posts linked below). 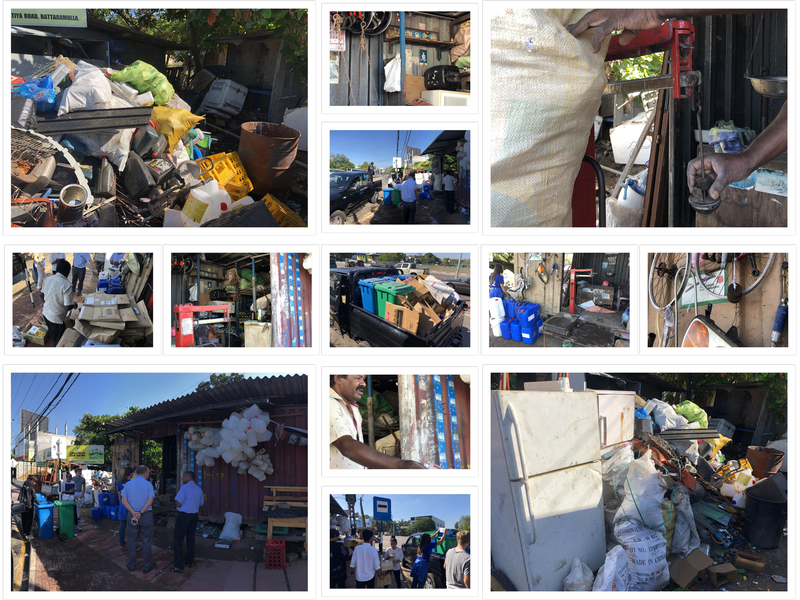 Viridis’ manager Buddhika Muthukumarana took us on a tour to show us the steps of sorting, clearing and palletization that happen in the process of recycling the plastic. The key to plastic recycling seems to be in the economics of production and collection. At the moment the price of petroleum is low and virgin plastic (which is a byproduct of the petroleum refining process) is at one of the lowest levels (see these links: PN and FT). Thus, the price for recycled plastic has gone down significantly to the point that it is hardly a viable process to collect, clean, chip and sell it. After the eye opening tour we were left to ponder ways to consider improving the recycling business while at the same time discouraging wasteful use of plastic in Sri Lanka and other places. A key step would be to get the producers of plastic to have a larger role in the recycling or substitution of their materials. At the moment they produce an abundance of disposable items but play no role in helping society to deal with the waste! Surely this has to change as part of a broad-based solution to address solid waste challenges that Sri Lanka faces. Sorting plastic based on type and color at the Viridis recycling plant. Portraits of Viridis employees sorting PET plastics. Portrait of Viridis employee sorting PET plastics. OSC students learning about the process and economics of plastic recycling at the Viridis plant. Buddhika, the plant manager, is giving the DP Geography class and R&S members the tour. Plastic pellets made from recycled plastic ready for export to markets (mainly in China). On the right are cleaned plastic bottles being readied to be chipped. Christopher, Chrishanthi. “Sri Lanka among the ‘dirty five’.” Sunday Times. 17 January 2016. Web & Print. “Garbage collection and recycling in the dumps.” Sunday Times. 17 January 2016. Web. 25 March 2016. Hannak, Nandini. 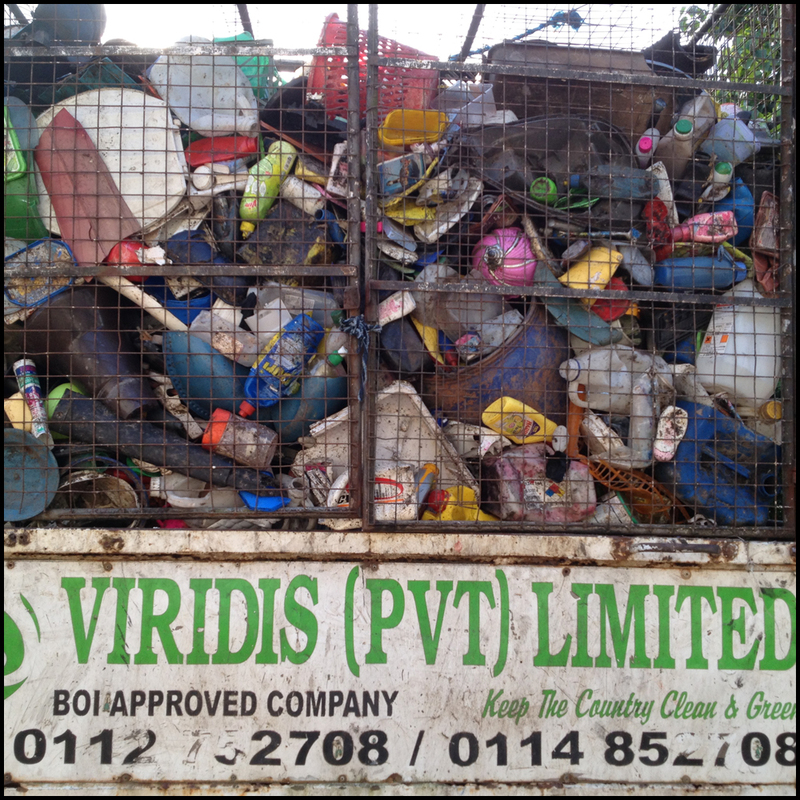 “Viridis Lanka Plastic Recycling Center.” The Nautilus (Nandini CAS blog). 4 December 2015. Web. Rodrigo, Malaka. “Polythene baddies hammered from tomorrow.” Sunday Times. 31 January 2016. Web. 25 March 2016. Saheed, Nisala. “Viridis Recycling Plant Visit.” CAS: A Step Outside Shelter. 27 December 2015. Web. Warakapitiya, Kasun. “Poor rubbish collection hatching dengue menace.” The Sunday Times. 31 January 2016. Web & Print. Waste Management Unit. Sri Lanka Central Environmental Authority. Web. Weigh scale with glass bottles stacked in the back at the scrap dealer near the OSC campus. He is quite picky about what he buys and only wants clear glass. Situated in small tin huts to large garage-like storage areas, the scrap dealers in Battaramulla are one of the few ways in which Sri Lanka’s garbage ends up in somewhat environmentally friendly uses. Copper, paper, aluminium, plastic and glass are all collected by these scrap dealers. In exchange for 2 LKR per kilo, the scrap dealer accepts glass; the cheapest commodity to recycle (by comparison paper sells for LKR 5). Glass is one of the easiest resources to recycle and reuse, but to what extent does Sri Lanka do this? Glass is 100% recyclable and does not lose its value the way plastic does (Berryman). Due to the fact that glass can be shaped manually and is hard, it can be and fortunately is used for a lot of different things; especially storing food and drinks as it does not flavor its content. Glass is made mostly out of the raw material sand, and the production of glass reduces emissions. Not all types of glass can be recycled though, for example windows and panels and glass containers that are too small. They then have to go through a different process to be recycled which is not as environmentally friendly as the usual way to melt and recycle glass (Glass Packaging Institute). In Battaramulla, the scrap dealer therefore only accepts glass bottles, and this one specifically only takes clear bottles. As a geography class we visited the scrap dealer near OSC to ask him about his business and the materials that he accepts for recycling. The small house next to the road is stacked up with cardboard, metal pieces, paper and glass bottles, mostly Arak bottles as they are clear and is a popular choice amongst Sri Lankans. An Arak bottle weighs around 200 grams, which means that he takes five bottles for 2 rupees. The glass and the other materials are then taken by a bigger corporation and later transported to India to be processed and recycled there. The problem that the scrap dealer in Battaramulla and other ones as well face is that they only get minimal support from the government, which makes it problematic for their own businesses but also for more scrap dealers to start businesses and recycle more. The statistics of recycling of glass in Sri Lanka are limited, but there is global information available. According to Glass Products Germany is the biggest glass exporter in the world, and the US is the biggest importer of glass bottles. Not only does glass save energy by using recycled glass, but each 1000 tonnes of recycled glass that we melt saves 314 tonnes of CO2 (Berryman). Glass is made of silica sand, soda ash and limestone. While the extraction of limestone releases Carbon Dioxide into the atmosphere, it is still more environmentally friendly than most other packaging materials. Recycled glass is used in the production of new glass. Colour in glass is added by adding substances such as carbon and iron. Click on the following link to find out more about how bottles are manufactured. Using glass bottles (as opposed to plastic) is a significant benefit to the environment, especially when technology is rapidly growing, and global warming is increasing. Using glass will reduce the amount of harmful substances that are released when using other materials for everyday uses. It is stable and is easily used and cheap. All around the world using glass would be a more environmentally friendly choice than plastics and cardboard. Glass does not only have to be recycled in factories, but it can also be reused healthily at home e.g. for containers and bottles, while cheap types of plastic get cracks and scratches where bacteria can grow. For environmental health and human health, increasing the use of glass and decreasing the use of materials like plastics and paper would help, but as a start, the simple act of recycling glass bottles would help local scrap dealers and the environment. Berryman. “Benefits of Glass Recycling.” World Class in Glass Recycling RSS. N.p., n.d. Web. 03 Mar. 2016. Chan, Amanda L. “What You Need To Know Before You Reuse That Plastic Water Bottle.” The Huffington Post. n.d. Web. 06 Mar. 2016. “Glass Bottles.” OEC. N.p., n.d. Web. 03 Mar. 2016. .
Glass Packaging Institute. Recycling. 2015. List. 3 Web. March 2016. “Learn About Glass.” Glass Packaging Institute. N.p., n.d. Web. 6 Mar. 2016.